This Triple Berry Yogurt Bowl is my new go-to breakfast obsession. It tastes super indulgent, comes together in minutes and is so filling! The warm berries and honey provide the perfect amount of sweetness and the almonds and strawberries add great texture. I know people love smoothie bowls and oatmeal bowls, but I think I’m hooked on yogurt bowls. I can’t wait to share more! This whole Triple Berry Yogurt Bowl is 243 calories or just 2 Weight Watchers Freestyle SmartPoints. Such a freestyle smartpoints bargain! Looking for more tasty, lightened up breakfasts like my Triple Berry Yogurt Bowl? Check out my Apple Streusel French Toast Muffins, Ham and Cheese Hash Brown Quiche, Maple Bacon Breakfast Wraps, Pear Gingerbread Baked Oatmeal Singles, Bubble Up Breakfast Casserole, Strawberry Banana Baked Oatmeal Singles, Hummus and Feta Omelet, Mini Dutch Baby Pancakes, Sausage Egg and Cheese Hash Brown Cups and many more in the breakfast category of my recipe index! In a microwavable dish, combine the raspberries and blueberries. Microwave on high for 30-40 seconds. Use a spoon to stir and mash the berries. Allow to cool slightly for 2-3 minutes. 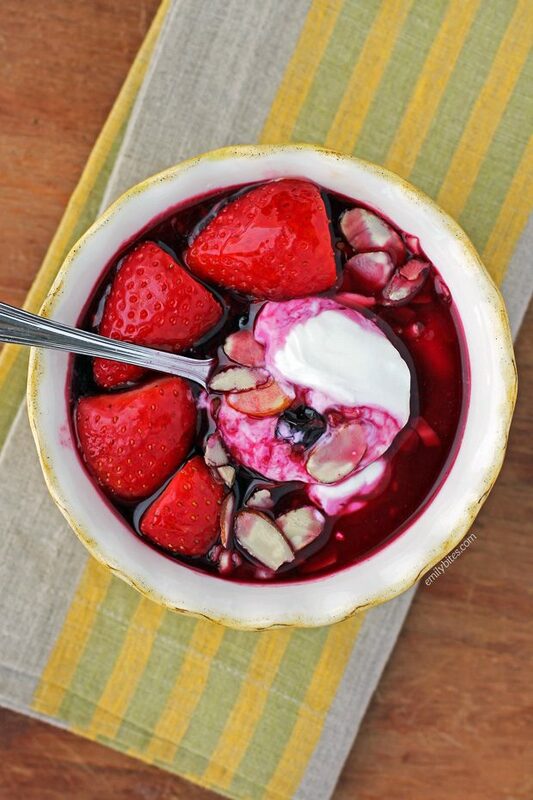 Spoon the yogurt into a separate bowl. 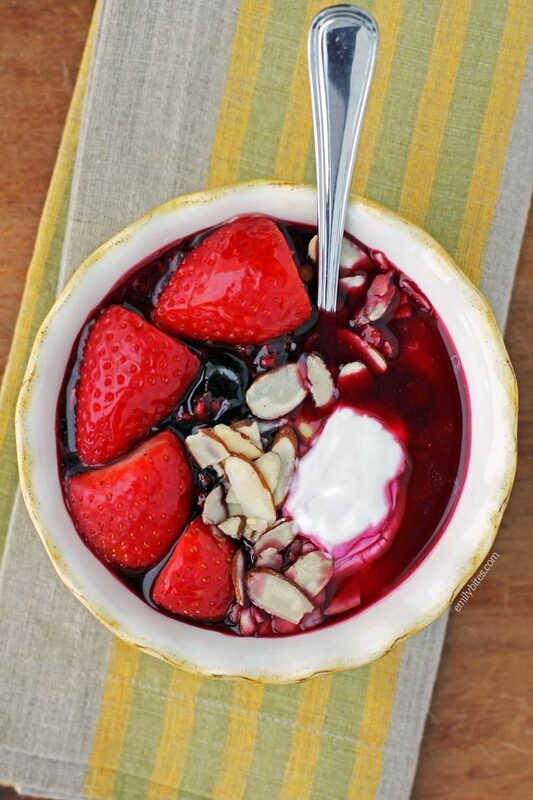 Drizzle the yogurt with the honey and then top with the microwaved berries. Add the sliced strawberries and sprinkle the almonds on top. Serve immediately. OMG! Tried this today and it rocks!!!! And I am not a big fan of yogurt!!!!!! I see why you called this a breakfast obsession. The colors here are simply amazing and I bet it tastes just as good as it looks. Could you use frozen berries with this? Wow -this is great! I also do not like plain yogurt and was skeptical, but it looked beautiful and is low in points so I gave it a try. So glad I did. It was amazing! I am not sure all plain yogurts are created equal, so you may have to try different ones until you find the one right for you. Thank you! What brand of honey did you use? Just my store brand honey. I used the generic honey listings to calculate. Nothing fancy! I input the nutrition info into the Weight Watchers calculator and came up with 7 points. ?? Help! The best way to calculate the SmartPoints for a recipe is to use the recipe builder on the Weight Watchers website. The recipe builder recognizes zero point foods and does not assign them a value in the overall SP calculation, however these foods still contain calories, sugar, etc. If you plug the nutrition information for the recipe into the SP calculator it will count the nutrition information for these foods in the overall points per serving, often giving you a completely different result than the recipe builder.